One day, I was sitting on the bed letting my 3 year old comb my hair with a rat tail comb. All of the sudden she sticks the sharp end in my ear and pushes. Blood starts running out of my ear. 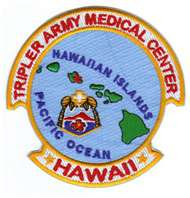 I rush her over to the neighbors and drive myself to Tripler Army Medical Hospital one army base away. 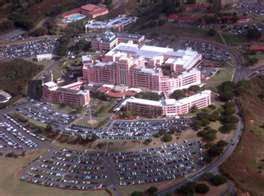 As a side note, Tripler is a huge complex on the Moanalua ridge. 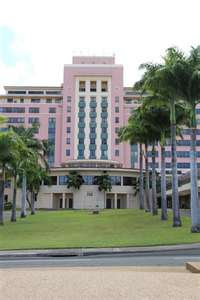 The engineers wanted to avoid an “institutional atmosphere” so they chose a pink stucco finish. At least you can’t miss it. This happens to be the one day that my then-husband was taking a board exam and can’t meet me at the ER. So I started the ubiquitous ER game of wait and wait and then wait some more. So I sit and wait and try not to freak out too much. Many hours later, I was told just to live with it and that it probably would heal. Great! 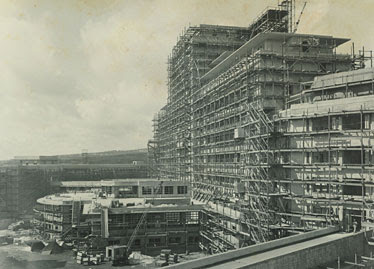 I could have had the patient care plan of “do nothing” from home. For a long time, I could pinch my nose and feel a little rush of air out of the hole in my ear. Lesson learned! No sharp, poking object for kids because the eye they poke-out just might be yours!